Today I’m here to share with you the first post of a new meme I’ll be hosting on Gemrene. I haven’t seen this particular one done by others so if it is already floating around in existence, you have my sincerest apologies. Anyway, On My Wishlist is going to be a post series in which I tell you what books I would like to buy. Today’s list is long since it’s the first one, and I left quite a few titles out due to lack of room. I’ve divided the list into two categories: previously read and never read. Since I read most of my books from the library first, I’ve accumulated quite a collection of novels I loved and want to own. Then I have another list of novels I want to buy before reading, either because I know I’ll love them or don’t want to deal with the hassle of borrowing them. 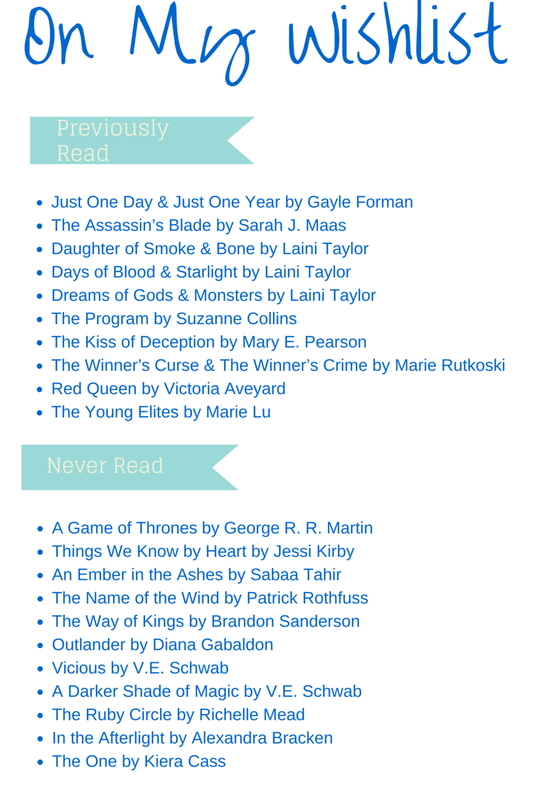 So without further ado, here is my first bookish wish list! What’s on your bookish wish list? Do we want any of the same books? Let me know!